With this weather, every meeting begins with how cold it is, and it is meant to be spring, and who knows when it will really come…. There is a lot of weather talk. And, somehow the greetings seem even warmer for the coldness outside. In fact, something that I have noticed after a few days of being here, is that the warmth of greetings was not reserved for my arrival. It continues, every day. And now I have been finding my way through the complexities of forms of address, moving from the formal (lei) to the informal (tu) with more people. When it is appropriate! Use of the informal can be disrespectful, but it can also be an acknowledgement of ‘now we are friends’, said with a big smile. Yesterday, on my morning rounds of the shops, I was also introducing Mirella, a friend who has arrived here from Turin. Mirella transcribed and translated the interviews I did here last year on the theme of belonging (posted on this blog), and she was interested in meeting the people whose voices she had listened to. 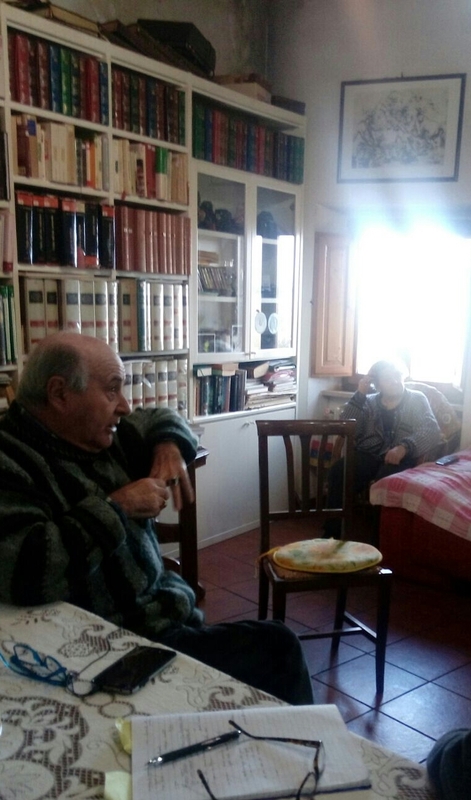 In the course of meeting Cinzia, in the Talozzi bistro, we raised the possibility of doing an interview with her father, who, as the mayor of Anghiari in the ’80s, had made a major contribution to the development of Anghiari as a cultural centre. As enthusiastic as ever, Cinzia had us organised into an interview later that very day. At 4.00 in the afternoon, we met again with Cinzia at her parents’ house, located in the mediaeval part of town, with a wonderful view over the valley. An energetic 80 year old, Franco Talozzi is now happiest when in his kitchen garden (orto), working with the earth, watching plants grow. This gives him a sense of life, and connects him with his childhood, growing up in a family of farm workers (contadini). He spoke also of the importance of curiosity to a sense of life, how important it was to never stop learning – a view that was evident in the simple but comfortable, book-filled living room where we were talking. He was remarkably modest about his work as mayor, and his contribution to the Anghiari community, clearly regarding these activities as a service. Cinzia had made a mantovana cake (a local traditional cake) for the occasion, which was served with a vin santo after the interview. All welcomely warming, setting us up well for heading back out into the weather. 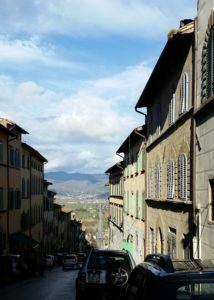 As well as my daily ritual of walking around the town, the other thing that I love doing here is walking in the hills and mountains that surround Anghiari. And today, I took Mirella on one these walks. I had thought of it yesterday, looking at that view across the valley. 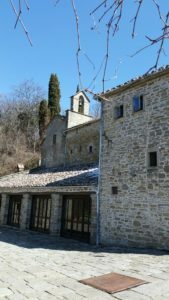 If you look in a direct line from the straight road that goes from Anghiari into the valley to Sansepolcro, up into the mountains, it is possible to see, about half way up, a monastery. 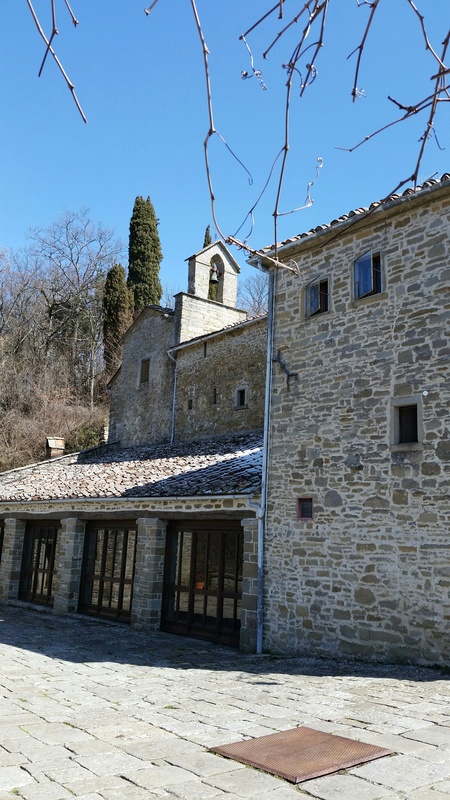 From this francescan monastery, (il convento di montecasale), there are wonderful paths through the mountains, some taken by monks, including San Francesco himself, as they travelled between Assisi and La Verna. With the snow up there, the paths, the landscape, were quite changed. The streams were full and pouring down the hills, water was pouring from springs. And snow and ice on the paths called for a certain mindfulness in the walking! 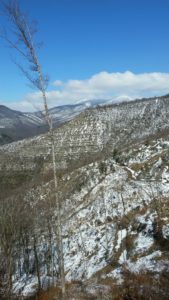 These mountains always have a remote feeling, despite the ancient hamlets and cultivated areas throughout them, but, today, they felt even wilder. And there was a bitterly cold wind. When we found a sheltered spot in the sun, bread, pecorino, walnuts and tea just tasted so good.